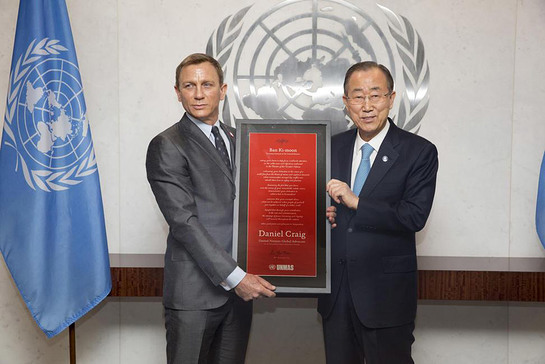 The United Nations Secretary-General Ban Ki-moon today announced the designation of renowned actor Daniel Craig as the first UN Global Advocate for the Elimination of Mines and Explosive Hazards. In a brief ceremony held at UN Headquarters, the Secretary-General thanked Mr. Craig for his commitment to support the UN’s vision of a world free from the threat of landmines and explosive remnants of war. “Along with moviegoers worldwide, I have been on the edge of my seat watching Mr. Craig, as James Bond, defuse ticking time-bombs with seconds to spare. I am even more excited that Mr. Craig has agreed to use his star power to draw attention to the noble causes of mine destruction and mine awareness,” said Mr. Ban. “As 007, Mr. Craig had a ‘licence to kill.’ Today we are giving him a ‘licence to save,’” said the UN chief. The designation is one of a number of events organized to observe the 10th anniversary of the International Day for Mine Awareness and Assistance in Mine Action and the Secretary-General expressed hope that Mr. Craig would raise public awareness about UN mine action efforts, visit mine action programmes worldwide, and assist in raising political and financial support. 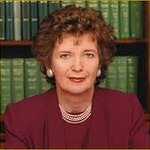 Mr. Craig, who has said he looks forward to taking up the Secretary-General’s invitation to visit UN mine action programmes in the coming months, added that he was humbled by his designation. Designation as UN Global Advocate for the Elimination of Mines and Explosive Hazards applies for three years but Mr. Craig has a long standing interest in the global campaign to ban landmines and explosive remnants of war and has already done work for the UN Mine Action Service (UNMAS), narrating two videos for the office in 2014. The Secretary-General paid tribute to Mr. Craig’s work and that of the Mine Action Service, which has been working to clear mines, educate people on risks, assist victims, destroy stockpiles and advocate for the elimination of landmines and explosive hazards since 1997.